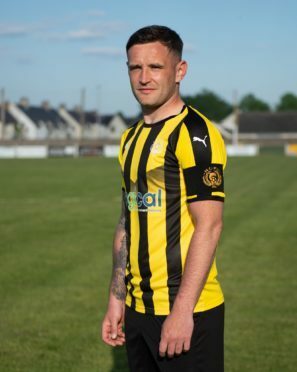 Gregg Main, pictured in Nairn County's new 2018-19 strip, will have his testimonial game at the end of the month. Main has not played since April 2017 after damaging his anterior cruciate ligament against Inverurie Locos but after 14 years around the Wee County’s first-team, his achievements will be celebrated with a series of events this season. A testimonial game is scheduled for June 30 against Ross Countyfor the 31-year-old, who has made 293 appearances for the club since making his debut in March 2004. He is relishing getting back for pre-season and putting himself to the test again, after more than a year on the sidelines. Main said: “The knee is getting stronger and I’ve been in the gym every day for the last four weeks. I feel strong and I’ve had no setbacks. Knowing it was my testimonial season made it a massive incentive to get back and I should be good to go for it. Main modelled the Wee County’s new strip last month, which is a homage to the 1976 Highland League champions with the club’s first return to a striped shirt in 32 years. Nairn open the 2018-19 league campaign away to Formartine United on July 28, which will pit Main against former team-mates Conor Gethins and Wayne MacKintosh. He feels if they keep their squad together at Station Park, they could have another promising season.